I am glad to welcome you, who have come to Rome on the occasion of the fiftieth anniversary of the Missionszentrale der Franziskaner. I thank Fr. Matthias Maier for his kind words. 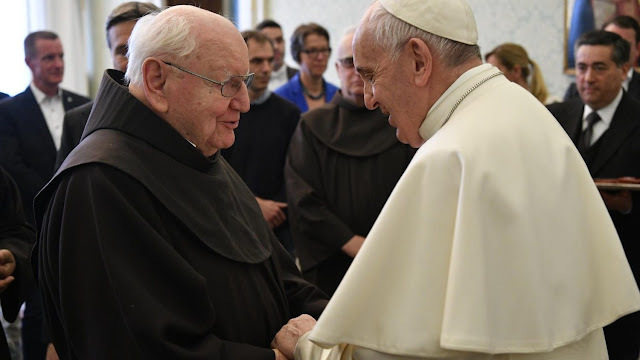 It is good that you as a community of religious brothers and committed lay faithful address all people of good will to motivate them to help the needy and marginalized throughout the world to obtain a better future. In this way, the word of Jesus is newly realized in a concrete way: “Truly I tell you, whatever you did for one of the least of these brothers and sisters of mine, you did for me” (Mt 25: 40). Your initiative is the result of the parish activities in Bonn-Bad Godesberg. Special thanks go above all to the first director who served for many years, Fr. Andreas Müller, who thanks to God is present among us today. Saint Francis of Assisi has always been an example to you: he wished to live poor and to let himself be touched by the poverty of the people. In this way he found Christ’s peace and became himself one who lived from the gifts of Providence. In this spirit, your missionary centre, with its modest origins, has been able to weave a worldwide network of charity, solidarity and fraternity. The Saint of Assisi heard Jesus’ request: “Francis, go and repair my house that, as you see, is all in ruins”. Despite all the experiences of the limits of the Church at the time, he set out on his journey to live out the Gospel in an authentic way. Today too we sometimes suffer as a result of the limits of the Church. The words of the Crucified are a call to us all. Renewal will occur only if we listen to the Lord, letting ourselves be transformed by Him, and continuing to do good with Him. Indeed, faced with current challenges, we must make greater efforts for a good future for all. And with this aim your missionary Centre may continue to give its valuable contribution, first and foremost with the witness of your life and your faith! I wish, for your jubilee, typically Franciscan joy and trust. Persevere in your commitment to promoting the good of all people and the protection of creation. May merciful God bless you all, your religious community in Bonn, and your families, and keep you in his love!